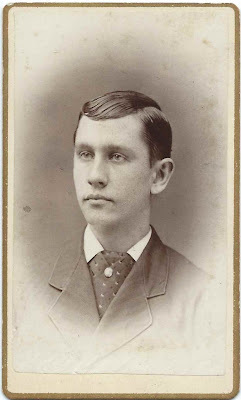 Carte de Visite of a young man identified on the reverse as Seth Downs. 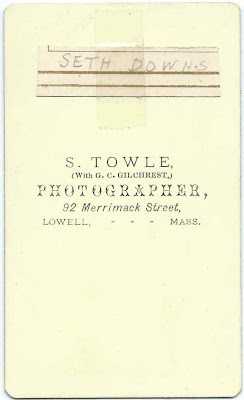 The photograph was taken by the S. Towle studio (with G. C. Gilchrest) at 92 Merrimack Street, Lowell, Massachusetts. Seth Arthur Downs was born August 29, 1863 at Lowell, Massachusetts, the son of Horatio B. Downs and Esther Ann (Briggs) Downs, who were born at Smithfield, Maine, and Lowell, Massachusetts, respectively. On October 1, 1884 at Lowell, Massachusetts, Seth married Mary F. McEnroe. Mary was the daughter of John and Frances McEnroe, according to her marriage record or - according to her death record, the daughter of Michael and Fanny McEnroe. Perhaps her father's named was John Michael McEnroe or Michael John McEnroe. Mary was born at Ballardville, a village in Andover, Massachusetts, either about 1860 according to her marriage record or about 1864 according to her death record. She died at Lowell, Massachusetts, on September 12, 1889. On August 17, 1892 at Oakland, Maine, Seth married Augusta F. Downs, daughter of John Downs and Amy (Stevens) Downs of Smithfield, Maine. 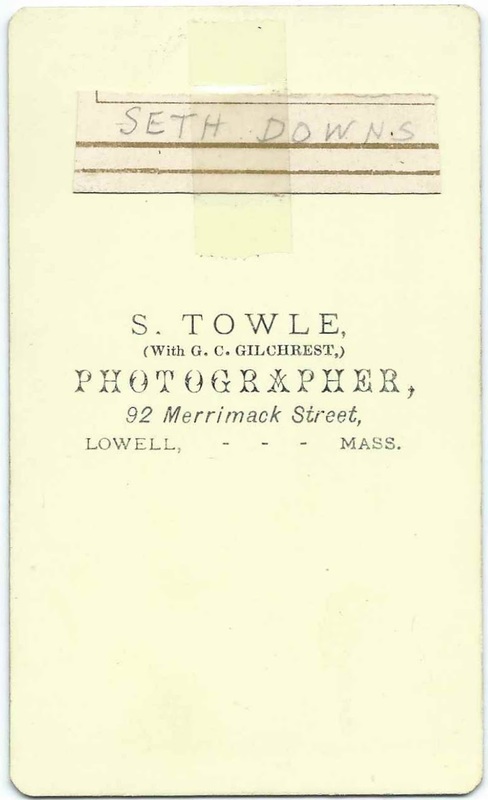 Augusta, who was born April 8, 1855 at Smithfield, Maine, was previously married to Otis E. Pierce, whom she married on November 30, 1876 at Waterville, Maine. There was an Otis E. Pierce who died at Columbia Falls, Maine, on November 15, 1885, but I don't know if he was the same Otis. At the time of their marriage, Seth was working as a machinist and Augusta as a dressmaker. Seth died in 1918 at Waterville, Maine, and Augusta in 1934; they're buried in the Pine Grove Cemetery at Waterville, Maine.